I'm actually pretty picky when it comes to fabrics or quilting patterns. On average, I only like about 5% to 10% of what I see. So when there's a designer whose collection I like almost all of, that's pretty special. I find her style to be a blend of mid-century modern (which I adore) and Japanese minimalism (which I adore even more) so naturally, I love pretty much everything she does. That designer is Brigitte Heitland of Zen Chic. She's an interior designer, and it really shows in her quilt photos. Every one of her quilts is photographed against a lovely interior that compliments the quilt perfectly. Now that's great presentation! Naturally, when I found out she had just come out with Zen Chic Inspired: A Guide to Modern Design, I was thrilled. I snagged a copy and waited quite impatiently for it to arrive. I've read through the book several times already, and there are quite a few must-make patterns in there for me. 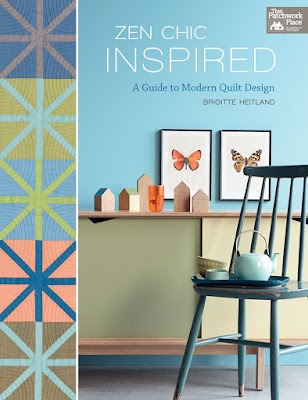 But the real appeal of the book isn't just the patterns, it's the way she wrote about designing quilts. I usually approach it with what technique I want to play with or (usually) what fabric I want to use up, and then trying to fit a pattern to that. Brigitte's approach is to think of the space that quilt will dress up, and designing according to that, and she offered tips and illustrations that I found both unique and very interesting. Reading through this book makes me feel really calm, relaxed, and happy ... and really, I think that was the aim. I'll eagerly look out for new fabric lines and patterns put out by Zen Chic, because if there's a designer that melds with my style so closely, that's something to hold on to.